Shouldn’t democracies be more inclined to politically include minorities, given that their vote counts in electoral competition? And shouldn’t such inclusion then lead to less conflict? Table 1 presents the results of a series of multivariate statistical models with the proportion of the excluded population as a dependent variable. Models 1-4 are generalized linear models with a logistic link function and the specification of the distribution as binomial. This is the most appropriate model specification if the dependent variable is a proportion and shows excess zeros due to those countries that are either ethnically homogenous (such as Korea) or where ethnicity is not politically relevant (as in Tanzania). In both groups of cases, the power structure is coded as fully inclusive (i.e., assigned a value of 0). Since the values of the exclusion variable can only change discontinuously and in „chunks“, depending on the size and number of ethno-politically relevant groups, all models include corresponding control variables. Model 1 in Table 1 shows that democracy is indeed strongly associated with the percentage of the population that is excluded from central government power. This association remains significant even in country-fixed effect models (results not shown), in other words, even if we control for other differences between countries that are not captured by the democracy variable. How are more specific institutional arrangements, such as proportionalism, parliamentarism, and federalism, related to ethno-political inequality? Scholars of the “consociationalist” school have argued that proportional systems of electing members of parliament are more conducive to political power sharing when compared to majoritarian rules that tend to produce two-party systems with limited minority representation (Lijphart 1994; Lijphart 1999). Consociationalists also argue that parliamentarism should foster minority representation. In parliamentary systems, the executive is elected by parliament and depends on the support of its major parties. This often allows minority parties to enter a governing coalition, consociationalists argue, and to be rewarded with senior government posts. A presidency that is independent from parliament, by contrast, tends to be occupied by a member of the national majority. Federal institutions are also seen as conducive to a more equal distribution of power since minorities that control a federal unit are able to use this as leverage to gain representation at the center as well. Model 2 reveals, however, that neither proportional representation nor parliamentarism nor federalism is associated with more inclusion. These results are based on Gerring and Thacker’s dataset (2008), which exclude autocracies. But they also hold if we use the more precise World Bank dataset, which includes autocracies but has data from 1975 onward only. The same results are also obtained with the more encompassing and equally granular Institutions and Elections Project dataset that covers all countries from 1972 onward or if we code federalism based on the Polity3 dataset, which includes all regime types and all post-war years up to 1994. It thus seems that democracy is associated with more inclusionary power configurations, independent of the precise institutional form that it assumes. Is the association between democracy and inclusion that Models 1 and 2 revealed due to a causal effect? Does democracy make a country more inclusionary? This question is evaluated in Model 3. It explores if having transitioned to democracy during the past 10 years produces a more inclusionary power structure today—which is not the case. But maybe this is because we compare young with old-established democracies and the younger ones haven’t yet had the time to realize the inclusionary potential of democracy? To evaluate this possibility, Model 4 uses a different dependent variable: The change in levels of exclusion in the next five years. It shows that recent democratization does not push a country along the path of a more inclusionary future (note that results from models 3 and 4 do not depend on how many years the independent or dependent variables are lagged). Maybe the association between democracy and inclusion is produced by a reverse causal effect? Do high levels of exclusion inhibit democratization? This is exactly what Model 5 suggests, in which the transition to a full democracy is the dichotomous dependent variable and the model is specified as a logistic regression. The same results from a country fixed effect model based on the 72 countries that underwent a democratic transition since 1945 (results not shown). The correlation between democracy and inclusion may therefore result from a selection mechanism: Ethnocratic regimes that exclude large proportions of their population cannot possibly risk democratization since this would most likely mean that they would have to vacate the throne. Think of current Rwanda dominated by a small Tutsi elite of former exilees from Uganda; or think of Saddam Hussein’s ethnocratic and Sultanistic regime. These certainly tentative and preliminary findings run parallel to other studies that show how economic inequality hampers the prospects of democratization (Boix and Stokes 2003; for a more nuanced interpretation, see Houle 2009). However, could democracy, proportionalism, majoritarianism, and federalism have a direct effect on conflict propensity? Shouldn’t democracies allow for the peaceful resolution of conflicting interest via a simple and legitimate mechanism of adjudicating between them? The entire quantitative research literature agrees that democracies are not more peaceful than other types of political regimes. Even the more modest claim that democracies and autocracies are both more peaceful than the “anocratic” regimes that lie in between them has been put into question. Previous studies that reported that anocracies are more war-prone (Ellingsen 2000; Hegre et al. 2001) were mostly based on the Polity IV dataset, whose measurement of “anocracy” includes intense political conflict or even violence (Vreeland 2008)—such that the previous findings boiled down to showing that conflict explains violence. Gleditsch et al. (2009) attempt to defend the democratic civil peace argument by using another measurement of democracy. However, the postulated inverted U-shape only holds when controlling for a host of other political variables (ibid. :184, model 1), but not in a simple model with only basic covariates (ibid., model 2). What is left to examine is whether there is a direct effect of proportionalism, parliamentarism, or federalism. Many have argued that presidential democracies such as the United States increase the zero-sum character of political competition and thus the chances of violent conflict (Linz 1990; Lijphart 1977), while parliamentarian systems are more conducive to political compromise and negotiation. Others maintain the opposite: that dividing power between a strong president and a parliament helps to avoid such zero-sum competition (Saideman et al. 2002; Roeder 2005, according to whom power sharing exacerbates and entrenches ethnic divisions and ultimately leads to instability and conflict escalation). 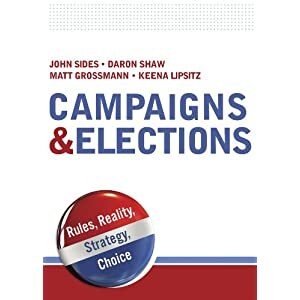 Furthermore, elected presidents will be oriented toward the common good of the broader electorate, it has been argued, rather than their narrow ethnic clienteles, thus avoiding the escalation of ethnic competition (Horowitz 2002; Reilly 2006). The literature is equally divided when it comes to the peace promoting effects of federalism. Nordlinger (1972) and Roeder (2007) argue that federalism provides a strong institutional platform from which regional elites can launch a violent secessionist project. Advocates of federalism (Lijphart 1977) have defended the opposite hypothesis: Federalism often leads to ethnic self-rule at the regional level, thus decreasing the relevance of the power configuration at the central state level (in line with the theory of nationalist violence by Hechter 2003). Finally, consociationalists also argue that proportional systems of electing members of parliament enhances substantial minority representation compared to majoritarian rules, which tend to produce two-party systems in which minority candidates fare less well (Lijphart 1994; Lijphart 1999). Independent of the power configuration at the level of central government, which as we have seen above is not influenced by parliamentarism, such minority representation in the legislative branch of government could help to moderate minority demands and on the other hand acquaint majority representatives with the perspectives and needs of minorities. I will discuss the relation between these three institutional arrangements and armed conflict in two different steps. In the first step, I seek to find out whether institutions affect ethnic armed conflicts in general. The second step proceeds to a more fine-grained analysis in which I distinguish between infighting between power sharing partners and rebellions in the name of excluded ethnic groups. This allows seeing whether political institutions offer different incentives for those included into the central government power structures and for those excluded from it, with correspondingly different effects on armed conflict. Other researchers have already shown that there is no evidence that proportional systems reduce the likelihood of armed conflict in general, including ethnic and non-ethnic conflicts (Schneider and Wiesehomeier 2008; Gleditsch et al. 2009). But maybe proportionalism affects specifically ethnic conflicts, as argued by consociationalists? Table 2 evaluates this proposition. Models 1 to 3 use the same model specification and the same set of independent variables as the analysis in Wimmer et al (2009). 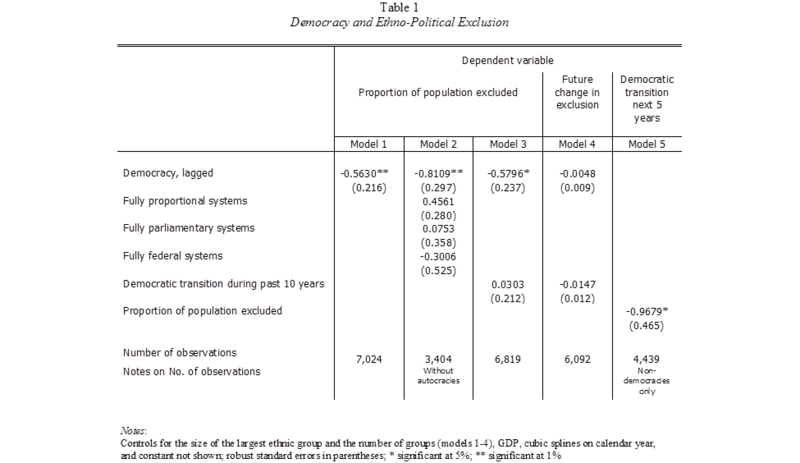 Each model uses a different coding of proportionalism, based on the GT, WB, and IAEP datasets respectively. None of these variables produce statistically significant results, even though the coefficients at least all point into the same (negative) direction. Models 4 to 6 evaluate if presidential systems are more or less violence prone. Previous research both on full scale civil war and on lower intensity armed conflict has again shown that presidential systems are not more, nor less conflict prone (Gleditsch et al. 2009; Goldstone et al. 2010:207). But what if we focus specifically on ethnic conflicts, since these are at the core of the debate among constitutional engineers? Again, no significant effects emerge (Models 4 to 6), whether in the model using the GT, the WB, or the IAEP datasets. The same non-result is obtained, I should note, when we evaluate whether parliamentary systems are more or less prone to experience armed conflict (results not shown). The final five models (7 to 12) investigate a possible relationship between federal structures of power and armed ethnic conflict. On the most general level, when not distinguishing between various types of armed conflict, Gleditsch, Hegre and Strand (2009) have again already established that federalism is not associated with more or with less conflict in the post-1945 world. But again, maybe federalism prevents specifically ethnic conflict, as argued by consociationalists? Models 7 to 9 use different codings of how the constitution defines the division of power between different levels of government. Models 10 to 12 go beyond the basic constitutional set-up of a state and code how far sub-national units do indeed wield political power: whether provinces have governments that are chosen independently of the center (Model 10), elect governors locally (Model 11), or are granted a special status as an autonomous region (Model 12). Clearly, constitutional federalism has no effect whatsoever on conflict propensity (Models 7 to 9). But at least one of the de-facto-power variables does produce a significant result: Autonomously chosen provincial governments, as coded by the IAEP, are associated with less armed ethnic conflict (Model 10). This results holds up, albeit at a reduced level of significance, even if we control for the ethno-political power configuration, that is, if the share of the excluded population and the number of power sharing partners are considered in the model (not shown). Thus, we can be quite certain that there is no indirect effect between provincial autonomy and conflict, as one could assume if inclusionary states or those with fewer power sharing partners would allow regions to choose their own governments. Unfortunately, however, the results are not upheld when using a similar WB coding of autonomous provincial government (Model 11) and Model 10 relates to years after 1972 only, such that we cannot be entirely sure how much we should rely on this finding. This caution is reinforced by additional analysis (results not shown here): When using Fearon and Laitin’s coding of ethnic civil war—relating to conflicts with at least 1000 battle deaths—the finding reported in Model 10 disappears completely as well. Maybe we arrive at a more positive conclusion regarding the peace-promoting effects of political institutions if we disaggregate the dependent variable? Isn’t it likely that institutions affect representatives of ethnic groups that form part of a governing coalition differently from those excluded from central government representation? The picture that emerges is slightly more complex (see Table 3). There is again no support for the idea that proportional systems of representation affect conflict probability—neither of infighting nor of rebellions (see Models 1 to 3). And for only one coding of presidentialism—the one based on the WB dataset shown in Model 5—do we find a significant effect. Presidentialism is associated, in this model, with a lower likelihood of infighting between power sharing partners, but not with rebellions. This is consistent with the analysis of infighting as a consequence of a commitment problem (Wimmer et al. 2009; Roessler 2011): A strong president might be better able to hold a fractious coalition together than a prime minister who is dependent on parliamentary support. Further supporting this view with a relational argument, Hale (2011) finds that in the post-Soviet world, presidentialism produces strongly integrated, hierarchical patronage networks focused on the president, while parliamentarism tends to result in a more fragmented system of competing alliance networks. The above finding would also lend support to those constitutional engineers who emphasize that strong presidents are less likely to cater to their own ethnic clientele and, if elected by popular vote, need to seek those votes across ethnic divides. However, the association between infighting and presidentialism disappears once we take the ethno-political power configuration into account. This is not due to an indirect effect since presidential systems do not have more power-sharing partners (not shown). Furthermore, presidentialism reduces infighting only with one particular coding of presidentialism and does not show up when using the other two codings (Models 4 and 6), thus raising doubts about the robustness of this finding. In sum, neither proportionalism nor presidentialism has any significant effect on rebellions in the name of excluded populations. And there are only weak and not very robust signs that presidentialism might reduce the chances of infighting. This leaves us with federalism. The results are rather contradictory, in line with Horowitz’s (1985) assessment of the qualitative evidence. In four of the six codings of federalism, no effect whatsoever can be discerned (Models 8, 9, 11, and 12). 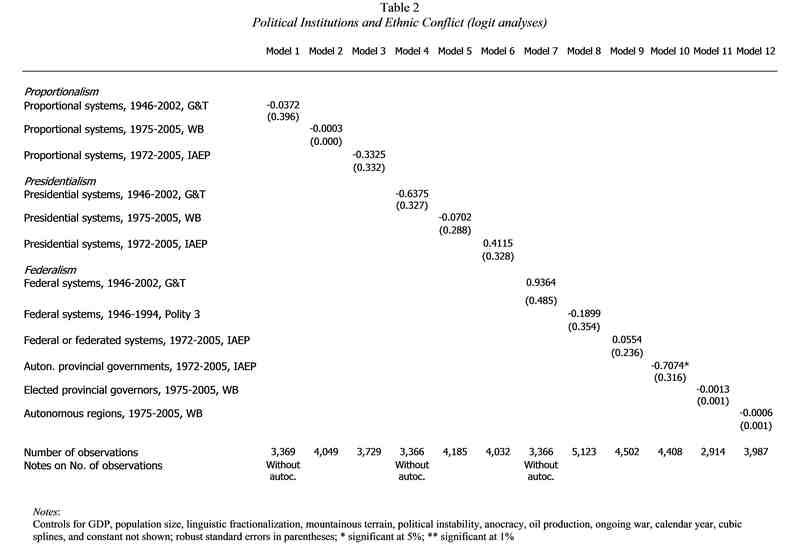 But when using the Polity3 data (Model 7), which covers all countries from 1946 to 1994, an interesting finding appears: Federal states are significantly more likely to see infighting, but also experience significantly less rebellions in the name of excluded populations (in line with consociationalists arguments). However, the coding of federalism provided by the IAEP (Model 10) produces quite different results: Autonomously chosen provincial governments are associated with less infighting but not with rebellion. We already found a negative significant result for this variable when regressing on all ethnic conflict (Model 10 in Table 2). We can now add more precision to the analysis, since we now know that the effect is limited to conflicts between power sharing partners. How to adjudicate between these two conflicting findings that we get from the Polity and IAEP codings of federalism? Much more detailed analysis of the actual coding rules and the case universes that they create would be needed to answer this question. For the moment, it suffices to note that there are good reasons to trust the results based on the IAEP dataset more than those derived from the Polity data. First, the Polity3 based results disappear when India (a federal state with many infighting conflicts) is excluded from the analysis, or if linguistic fractionalization is not part of the equation, or if the ethno-political power configuration is taken into account by adding the number of power sharing partners as well as the percentage of the excluded population to the regression model (results not shown). The IAEP results are more robust and hold up without India, without controlling for linguistic fractionalization, or with the ethno-political variables added to the equation. In addition, a similar coding of provincial autonomy (based on whether or not provinces have locally elected governors) is also associated with infighting, even if the coefficient is only borderline significant (Model 11). In sum, federalism does not affect rebellions in any significant way, but it may well be that autonomously chosen provincial governments reduce the chances of infighting between power sharing partners. One might object to this series of rather sobering results—from the point of view of constitutional engineers—that one needs to take combinations of institutions into account and disentangle the effects that presidentialism, federalism, and proportionalism have in democracies from those they show in autocracies. Electoral rules might only influence conflict processes when votes can indeed change who is in power; federalism could show its pacifying effects in autocratic regimes only, where conquering the center is unfeasible (as reported by Saideman et al. 2002; Bermeo 2002). To test for this possibility, I ran all models presented in Tables 2 and 3 with subsamples of autocracies and of non-autocratic regimes. The results remain substantially similar to those reported above. But perhaps parliamentarism shows its moderating effects on the dynamics of political competition and conflict only if combined with proportionalism—as argued by consociationalists? Indeed, for the Gerring and Thacker as well as the IAEP datasets, the combination of proportionalism and parliamentarism is associated with a significantly lower risk of infighting but does not affect rebellions. However, using the World Bank dataset produces the opposite result: Infighting between power sharing partners is significantly more likely in such consociational regimes, while rebellions are again not less frequent in consociational states (results not shown). I conclude that there is no robust and consistent association here. The only consistent finding is that combinations of political institutions have no association whatsoever with the risk of rebellion in the name of excluded population—by far the most frequent type of ethnic conflict in the post-war world. In sum, it might be that federalism or presidentialism have an independent effect on the dynamic of political competition and conflict between power sharing partners and reduce the chances of escalation into armed violence. Autonomous provinces make it perhaps less urgent to fight for the spoils of government at the center; independent presidents might overcome commitment problems in a ruling coalition of ethnic elites better than prime ministers responsible to the representatives of these elites in parliament. The results reported above quite unequivocally indicate, however, that presidentialism, proportionalism, federalism, or a combination of such institutions have no effect on the much more prevalent form of ethnic conflict, i.e. on rebellions by excluded groups. Recalling that 90 out of the 110 ethnic conflicts in the dataset represent rebellions, this suggests a limited overall role for institutions in mitigating conflict. Given that exclusion is far more risky than the prospects of infighting, it becomes evident that peace results not from a specific institutional form of government, but rather from inclusive power configurations—whatever the institutional forms that sustain them. Thus, no general recommendation can be made regarding the institutional setup best suited to guarantee peace. These might be democratic or undemocratic, consociational or centripetal, federal or unitarian, depending on context, historically established actor configurations, and institutional legacies (see the new realism among constitutional engineers: Horowitz 2004; Ellis 2003). No recipe of institutional reform—democratization, electoral systems engineering, and decentralization—seems universally suited to bring about political inclusion and sustainable peace. The best strategy to avoid armed conflict and war is therefore to foster a power structure that either integrates political actors from all politically relevant ethnic groups or that is not based on ethnic alliances at all but on a sustained process of nation building, which promises to depoliticize ethnicity over time. Effective and long-term prevention of ethnic conflicts might therefore need to touch the very fundamentals on which a nation-state is built: both the definition of the people in whose name a state is governed and the degree to and the ways in which ethnic background shapes access to central state power. If ethnic conflict is mostly the result of the capture of the state by specific ethnic elites and their constituencies, then nothing less than a lasting rearrangement of such power structures will suffice to bring durable peace. Unfortunately and ironically, such exclusionary regimes can often only be overthrown through violence and war. The political elites in power and the ethnic constituencies they privilege might not be willing to give up their monopoly over the state and its institutions. No prevention policy and no local “peace-building” initiative will be able to overcome such obstacles. It is unlikely, to illustrate, that Saddam Hussein’s tribalistic ethnocracy could have transformed gradually—under benevolent prodding by the “international community”—into a regime that would include Kurdish and Shiite elite segments into the ruling coalition. Similarly, Rhodesia under white rule showed little prospect, despite harsh international sanctions, to move toward a broad based government with adequate representation of the black majority. As neighboring South Africa shows, however, negotiated transitions away from ethnocracy are possible, if unfortunately rare. To increase the likelihood of such peaceful transitions, it may help to foster the willingness of the ruling elites to share power, including by building up corresponding pressure from their constituencies, and to steer leaders of excluded populations toward moderation and away from maximalist claims or revanchist programs. The data can be acessed at: http://dvn.iq.harvard.edu/dvn/dv/epr. See, however, Reynold’s (2011: 114-116) finding that majoritarian rules have resulted in more minority representation in parliaments than other electoral systems. It is based on the study of election results in 50 countries. For a review of the debate between “centripetalists”, advocating presidentialism, majoritarianism, and unitarian systems, and “consociationalists”, who favor parliamentarism, proportionalism, and federalism, see Reilly (2006). Many other institutional features, including a trans-regional support basis as a pre-requisite for party registration or more complex electoral rules such as the alternative vote system, are often associated with centripetalism (see Reilly 2011). The same goes for the consociational approach, which also advocates mutual veto rights in a grand coalition of ethnic parties. These more detailed institutional arrangements are outside the purview of this chapter’s analysis, either because global data is not available or because some of these institutional features have been applied only very rarely. This contrasts, at least in part, with Reynal-Querol ( Both of these findings stand in opposition to those of Roeder 2005. Gerring and Thacker, for example, code a state as federal if it has a bi-cameral legislature with one of the chambers composed of the delegates of the provinces. One might argue that political institutions are effective conditional on a particular ethno-demographic make-up of the population. As a simple test of this proposition, I ran all models of Table 2 with an interaction effect between the political institution and the size of the largest politically relevant ethnic group. No noteworthy effects appeared in the results (not shown). Bermeo, Nancy. “A new look at federalism. The import of institutions,” Journal of Democracy 13 (April 2002): 96-110. Boix, Charles and Susan C. Stokes. “Endogenous democratization,” World Politics 55 (July 2003), 2003: 517-549. Ellingsen, Tanja, “Colorful community or ethnic withces’ brew? Multiethnicity and domestic conflict during and after the cold war,” Journal of Conflict Resolution 44 (April 2000): 228-249. Ellis, Andrew, “The politics of electoral systems in transition”, in Andreas Wimmer et al., Facing Ethnic Conflicts Towards a New Realism (Boulder: Rowman & Littlefield, 2003), 258-273. Gerring, John and Strom Thacker, A Centripetal Theory of Democratic Governance (Cambridge: Cambridge University Press, 2008). Gleditsch, Nils Petter, Håvard Hegre and Håvard Strand, “Democracy and civil war,” in Manus I. Midlarsky, Handbook of War Studies III: The Intrastate Dimension (Ann Arbor: University of Michigan Press, 2009), 155-192. Goldstone, Jack A., Robert H. Bates, David L. Epstein, Ted Robert Gurr, Michael B. Lustik, Monty G. Marshall, Jay Ulfelder and Mark Woodward, “A global model for forecasting political instability,” American Journal of Political Science 54 (January 2010): 190-208. Hale, Henry E. “Formal constitutions in informal politics: Institutions and democratization in post-Soviet Eurasia”, World Politics 63 (October 2011): 581-617. Hechter, Michael, “Containing nationalist violence”, in Andreas Wimmer et al., Facing Ethnic Conflicts. Toward a New Realism (Boulder: Rowman & Littlefield, 2003), 283-300. Hegre, Havard, Tanja Ellingsen, Scott Gates and Nils Petter Gleditsch, “Toward a democratic civil peace? Democracy, political change, and civil war, 1816-1992,” The American Political Science Review 95 (March 2001): 33-48. Horowitz, Donald L, Ethnic Groups in Conflict (Berkeley: University of California Press, 1985). Horowitz, Donald L, “Constitutional design: Proposals vs. process”, in Andrew Reynolds, The Architecture of Democracy: Constitutional Design, Conflict Management, and Democracy (Oxford: Oxford University Press, 2002). Horowitz, Donald L, “Some realism about constitutional engineering”, in Andreas Wimmer et al., Facing Ethnic Conflicts. Toward a New Realism (Boulder: Rowman & Littlefield, 2003), 245-257. Houle, Christian, “Inequality and democracy. Why inequality harms consolidation but does not affect democratization,” World Politics 61 (October 2009): 589-622. 1945-1990 (Oxford: Oxford University Press, 1994). Lijphart, Arend, Patterns of Democracy: Government Forms and Performance in Thirty-Six Countries (New Haven: Yale University Press, 1999). Linz, Juan J, “The perils of presidentialism,” Journal of Democracy 1 (Winter 1990): 51-60. Nordlinger, Eric A, Conflict Regulation in Divided Societies. Occasional Papers in International Affairs (Cambridge: Center for International Affairs, Harvard University, 1972). Regan, Patrick and David Clark, Institutions and Elections Project. Accessed at http://www2.binghamton.edu/political-science/institutions-and-elections-project.html. Department of Political Science, Binghamton, 2011. Reilly, Benjamin, Democracy and Diversity: Political Engineering in the Asia-Pacific (Oxford: Oxford University Press, 2006). Reilly, Benjamin, “Centripetalism: Cooperation, accomodation, and integration”, in Stefan Wolff and Christalla Yakinthou, Conflict Management in Divided Societies: Theories and Practice (London: Routledge, 2011). Reynal Querol, Marta, “Ethnicity, political systems, and civil wars,” Journal of Conflict Resolution 46 (February 2002): 2954. Reynolds, Andrew, Designing Democracy in a Dangerous World (Oxford: Oxford University Press, 2011). Roeder, Philip, “Power dividing as an alternative to ethnic power sharing”, in Philip G. Roeder and Donald Rothchild, Sustainable Peace. Power and Democracy after Civil War (Ithaca: Cornell University Press, 2005), 51-82. Roeder, Philip G, Where Nation-States Come From. Institutional Change in the Age of Nationalism (Princeton: Princeton University Press, 2007). Roessler, Philip G, “The enemy from within. Personal rule, coups, and civil wars in Africa,” World Politics 63 (April 2011): 399-346. Saideman, Stephen M., David J. Lanoue, Michael Campenni and Samuel Stanton, “Democratization, political institutions, and ethnic conflict. A pooled time-series analysis, 1985-1998,” in Comparative Political Studies 35 (February 2002): 103-129. Schneider, Gerald and Nina Wiesehomeier, “Rules that matter: Political institutions and the diversity conflict nexus,” Journal of Peace Research 45 (March 2008): 183-203. Thorsten Beck, George Clarke, Alberto Groff, Philip Keefer and Patrick Walsh, “New tools in comparative political economy: The Database of Political Institutions,” World Bank Economic Review 15 (June 2001): 165-176. Vreeland, James Raymond, “The effect of political regime on civil war: Unpacking anocracy,” Journal of Conflict Resolution 52 (June 2008): 401-425. Wimmer, Andreas, Lars-Erik Cederman and Brian Min, “Ethnic politics and armed conflict. 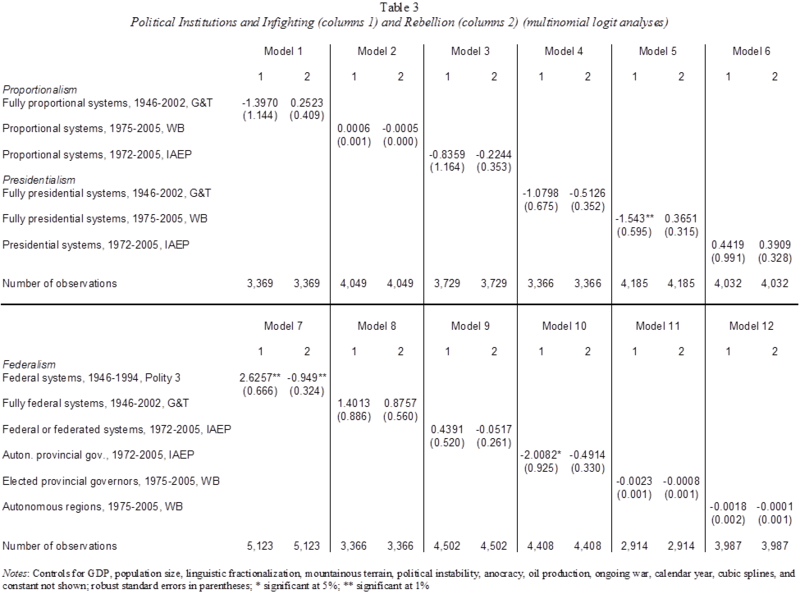 A configurational analysis of a new global dataset,” American Sociological Review 74 (April 2009): 316-337.